MamaBreak: Mrs. Meyers Review: It smells so Clean! In our household we have problems with using traditional laundry detergents. With children and adults with allergies galore, it is hard to find a soap that will work for the whole family. We have even used products that claim not to have dyes and perfumes, only to find that something else in the product produced a reaction for someone in the house. It is a frustrating process, especially when you have young children, to find something that works effectively to get clothing clean AND is not harsh on anyone's skin. That is why I was so excited to find Mrs. Meyer's. 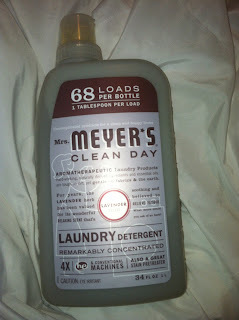 MamaBreak had the opportunity to try out Mrs. Meyer's Clean Day Aromatherapeutic Laundry Detergent in Lavender scent. First, the bottle is fairly small. Much smaller than the HUGE jug we are used to purchasing. 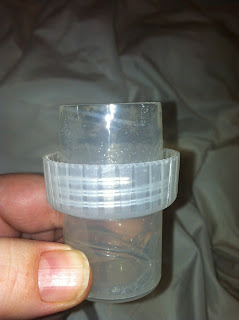 However, the little bottle can wash up to 68 loads, as it only requires 1 tablespoon for each load! It is super concentrated, so it takes just a little to wash an entire load. It can be used for both he washers, as well as conventional machines. The best part? You can also use it as a stain treater! 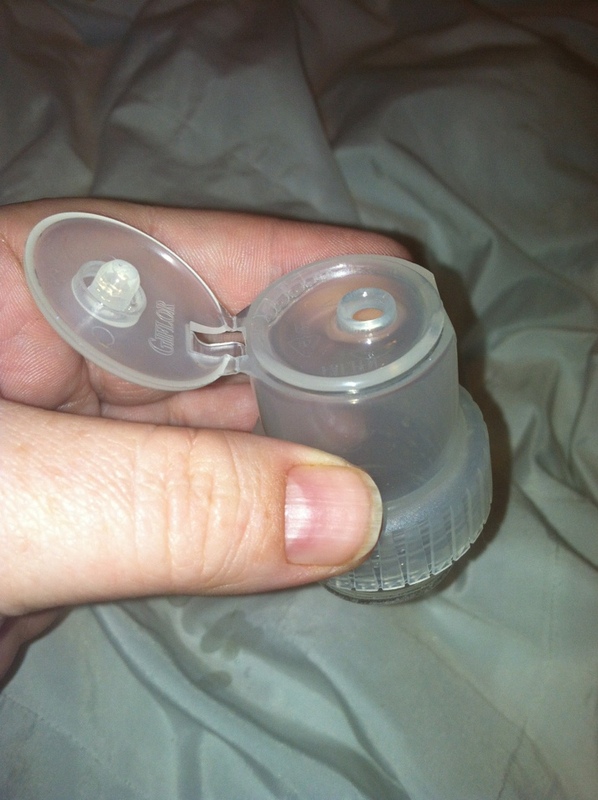 The measuring cup has a flip open top, so that you can dump it into the washer, or squirt a small amount as a stain treater! 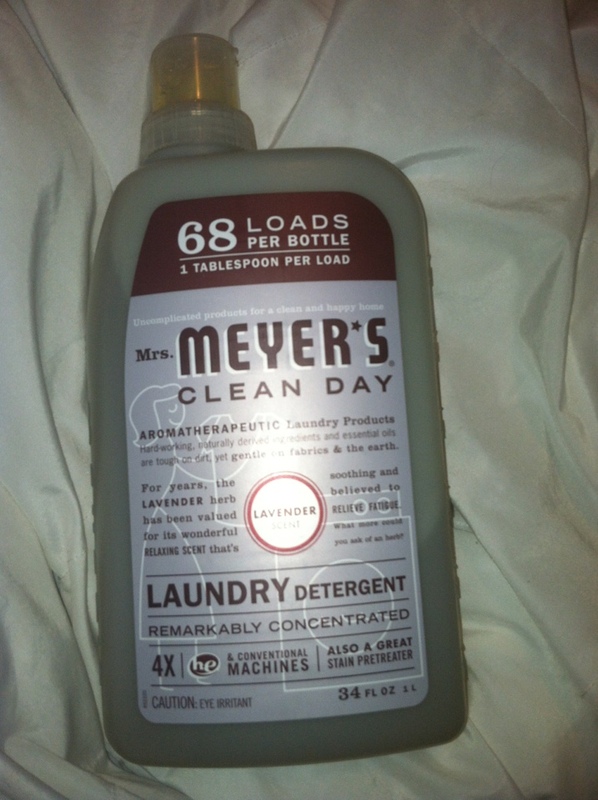 The products are cruelty-free, not tested on animals, AND biodegradable-- so not only is Mrs. Meyer's Laundry Detergent good for your laundry, but it is good for the earth as well! We reviewed the Lavender (which we LOVE!-- so soothing-- and I NEED soothing while doing laundry! ), but it is also available in Bluebell, Lemon Verbena, and Rosemary. Want to win your OWN bottle! Check our Giveaway TAB SOON! MamaBreak received Mrs. Meyers to review here on the website. We did not receive any other sort of compensation. As always, our experiences and opinions are our own. That is crazy that it only requires 1 tbsp, I would love to try Lemon Verbena! Lavender sounds fantastic too. Wow it only requires 1 tablespoon? That is amazing!!! I need to try this! I love this stuff! It cuts back on waste and it works well. Great review! My boyfriend is super sensitive to detergents, I may have to look in to this. That's crazy you use so little! Wow that sounds super concentrated. My family also has weird issues with certain laundry detergents. We have to double rinse all of our clothes. We've also had the problem of the one's that don't irritate us don't clean well enough. I will definitely be looking into this product. Thanks for sharing! I like how concentrated it is. Smaller bottles would help me hoard more on my shelves:>)Can't wait for you to post your contest! I need to try this, with 7 kids, my household is the same way! Wow, that looks amazing. If the scent really stays, I would love that. Even big name brands of conventional detergent seem to have no scent after washing. I love lemon, so I need to try that one. I would LOVE to try this out!! i have allergies too and the ischemic from the cleaners drive me mad! TY!! I was not even aware this product existed! Great review! I absolutely LOVE Mrs. Meyers products and I would absolutely recommend them! Anything that comes in Bluebell!!? has my attention!! I bet it just smells so fresh! Thanks for the review! I am going to have to check this one out! I can't believe it takes so little and works!! I am amazed, and really want to try it! I have heard of the company, but didn't know they had detergent too! Thanks for sharing this! How exciting! Great to be able to use so little, and we have some sensitivities and such here as well. Will look for the giveaway! Thanks for the review!